The spacecraft's titanium vault and a polar orbiting flight plan that avoids intense radiation regions around Jupiter's equator will help reduce damage to Juno's instruments. In less than 3 weeks, NASA’s Juno spacecraft will enter into polar orbit around Jupiter on a mission that could help reveal secrets about the giant planet as well as the formation of the solar system and Earth, scientists said at a 16 June briefing. First, the spacecraft has to pull off an engine burn maneuver, scheduled for 4 July, to enter into orbit in Jupiter’s intense radiation environment. Following the maneuver, the solar-powered Juno, launched in August 2011, will orbit Jupiter 37 times over 20 months. On board is a suite of instruments that will remotely sense the planet’s core, probe Jupiter’s magnetic field, investigate auroras, measure water and ammonia in the atmosphere, and take what scientists anticipate will be stunning photos as close as about 5000 kilometers above Jupiter’s cloud tops. Juno’s mission ends in February 2018 with a planned crash into Jupiter, taking care to avoid contaminating the potentially habitable icy moon Europa with microbes from Earth. Among the spacecraft’s primary goals is finding out how solar systems and planets are made. “We really want the recipe,” Juno principal investigator Scott Bolton said at the briefing, held at NASA headquarters in Washington, D. C. NASA’s Jet Propulsion Laboratory (JPL) manages the Juno mission for Bolton, who is the associate vice president of the space science and engineering division at the Southwest Research Institute in San Antonio, Texas. Bolton said that Jupiter appears to be like a smaller version of the Sun, composed mostly of hydrogen and helium, but that a closer look at its makeup shows a planet enriched with heavy elements, including carbon, nitrogen, and sulfur. “We don’t know exactly how that [enrichment] happened, but we know that it’s really important” to figure out how so that scientists can better understand solar system formation, he said. A 35-minute main engine burn between 8:18 p.m. and 8:53 p.m. Pacific Time on 4 July will maneuver Juno into orbit. The looming date, timed for U.S. Independence Day, means that “nail-biting” time has already started, science team members said. 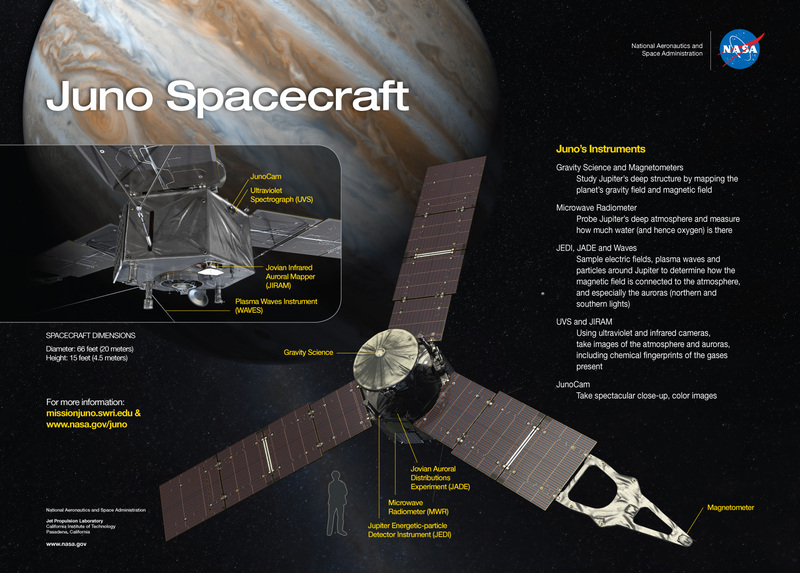 Rick Nybakken, Juno project manager with JPL in Pasadena, Calif., said that although the Juno team already has successfully fired the main engine twice and knows how it performs, a new factor is how well the engine does in Jupiter’s intense radiation environment. Jupiter has “the scariest radiation environment” of any planet in the solar system. Jupiter has “the scariest radiation environment” of any planet in the solar system, according to Heidi Becker, senior engineer in JPL’s Radiation Effects Group. Electrons trapped in the planet’s magnetic field accelerate to the point where they are moving at almost the speed of light. 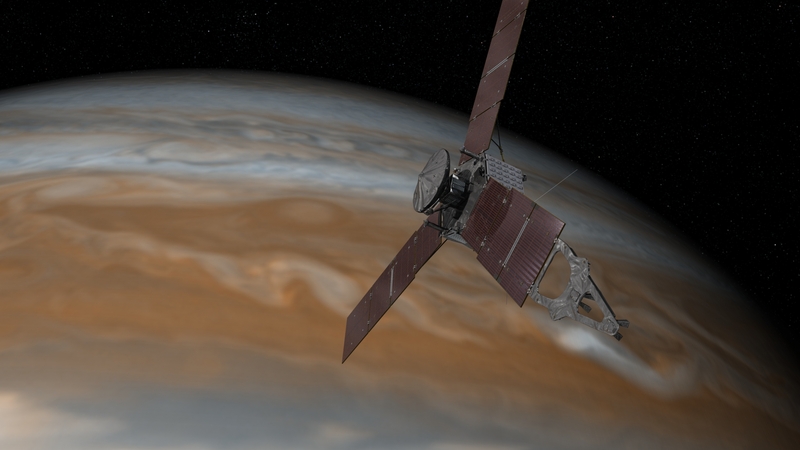 When the electrons hit Juno, they will ricochet and release energy “like a spray of radiation bullets,” she said. Becker explained that Juno “is wearing a suit of armor.” The armor includes a titanium vault to shield the spacecraft’s flight computer and much of its scientific payload from radiation. That protection, along with a careful flight path to avoid an intense region of radiation around Jupiter’s equator, will reduce the radiation dose on vital equipment, she said. Citation: Showstack, R. (2016), NASA’s Juno spacecraft set to orbit Jupiter starting 4 July, Eos, 97, https://doi.org/10.1029/2016EO054513. Published on 17 June 2016.